Right about now is when school becomes one big stress ball of emotions for me. Between testing and report cards and looming culmination....not to mention the senioritis that hits the fifth graders....April is really a hard month in which to teach. And it isn't just me. It seems like overall the staff (not just at my school but at all schools in my area) just tend to be a bit more stressed and down. 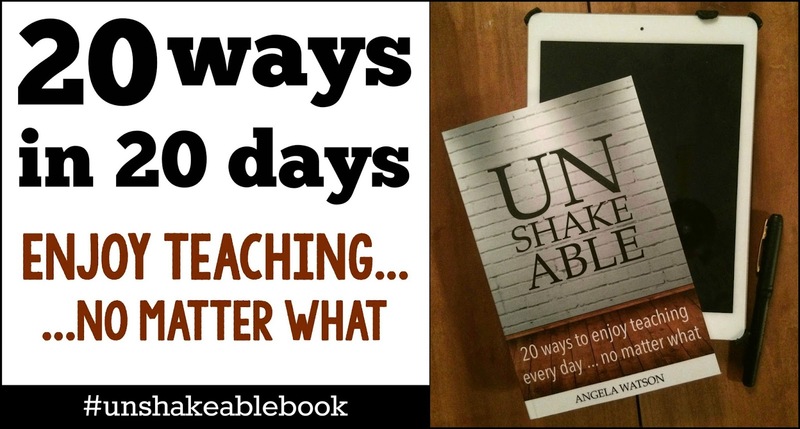 So when I read what Angela Watson of The Cornerstone for Teaching had to say in Chapter 7 of her new book Unshakeable: 20 Ways to Enjoy Teaching Every Day...No Matter What , it really struck a chord with me. This chapter is all about how you, one person, can affect the entire school culture. The big takeaway for me was to stay positive. In all of your interactions with colleagues, remain steadfast in your positivity. I have to admit, this is hard for me sometimes. It is just so easy to give in to the complaining as a way to destress. But, as Angela points out, it is actually more stress making to do that. Staying in the negative is perpetuated by being negative. If you give in to the complaining colleague, you are helping them to stay negative as well as to bring yourself into a negative space. By finding just one thing that is positive about the situation, you can instantly help not only your complaining colleague, but yourself, to enter into a more positive zone. Put potpourri in the staff bathroom. Write thank you notes to your fellow staff members for something they did to make your day easier. Acknowledge each other with a Teacher of the Week recognition. Compliment each other on lessons that went well or bulletin boards that are outstanding. All of these ideas can help to make people feel more appreciated at school and bring in a more positive climate. I know that tomorrow, when I go back after Spring Break, I will definitely be doing some of them. What are some things that you have done to help make your school a more positive place to be? How do you deal with negative people? If you would like to follow along with the rest of this book study, please click the image to the left. In our school, we have a voluntary "fish" committee. The fish committee is based on the starfish story. In case you have not heard of the starfish story, here is a VERY brief summary. A man is walking on the beach as the tide is going out. He bends down, picks up a stranded starfish, and throws it back into the water. A person passing by asks what the man is doing. The man explains that he is throwing the fish back into the water so that it may live. The person passing by states that the man cannot possibly save them all. The man replies as he throws the starfish back into the sea, "Made a difference for that one." Staff members (usually two to four) sign up for a particular month. During this month, the committee may bring in donuts one morning to share with the staff, organize a taco lunch where each staff member brings in a particular item for the taco salad ( the fish committee will mix it all up and serve it during the lunches), have chocolate or some other sweet available through out the month, or have an "Opening Day" celebration where hotdogs are served for the staff. Almost everyone takes a month and has a lot of fun thinking of things to do. I LOVE the Fish committee idea! It sounds so positive and motivating! Well, I am so excited that I have found this your post because I have been searching for some information about it almost three hours. You helped CV writing services help – don’t kiss any toads me a lot indeed and reading this your article I have found many new and useful information about this subject.